Oh sure, the online simulacrum of Scarborough-Agincourt Councillor Norm Kelly (Ward 40) still technically exists in some zombified form. On Sunday, October 22, it commemorated the 39th anniversary of John Paul II’s inauguration as Pope, and honoured the service of Corporal Nathan Cirillo. On Friday, October 20, it wished its 616,000+ followers a “Good morning!”, asked if they had any “weekend plans?”, and publicized Kelly’s #6DAD pins (available now at 6dad.ca). It still dutifully notes the Raptors home opener, the passing of Gord Downie, and, for some reason, the anniversaries of “Call Me Maybe” and Rush Hour. But make no mistake: the @norm-mania that swept Toronto in 2015 is dead, and whatever remains is the lingering vanity of a man too proud to admit when he’s finished. Every time the stone-faced 76-year-old councillor appears in my Twitter feed, looking confused and helpless in a T-shirt with his own face on it, I pray that someone will take @norm out to a beautiful farm in the country where all the novelty Twitter accounts can play in peace. There was a time, however brief, when people took pleasure and comfort in the sight of an elderly man pretending to like rap. But in 2017, the rotting corpse of @norm has become everything wrong with politics. We all remember in 2013, when Kelly—a journeyman politician since 1980—became deputy mayor during the stormiest stretch of the Rob Ford mayoralty. Kelly, as we all remember, took over Ford’s duties when Council stripped the mayor of his powers, and became Ford’s de facto replacement during his stint in rehab. Despite his right-of-centre voting record, Kelly earned across-the-spectrum admiration for his modest, conciliatory, and generally un-Ford-like leadership style. Someone in Kelly’s office saw an opportunity, and a Twitter account that had previously been devoted to updates on potholes and bicycle traffic made worldwide news for feuding with Meek Mill and defending Drake. In summer 2015, as Donald Trump was beginning his journey to the White House, a desperate world took a few minutes to enjoy the fantasy that an elderly, white, conservative city councillor cared about rap. Thus began the #6DAD nightmare we’ve lived in ever since. Kelly suddenly found himself onstage with Drake, awkwardly hooting at a crowd of millennials, “Ryersoooooon! Y’all, tuuuuuurn up!” Seeing dollar signs, he launched his damnable #6DAD clothing line, hawking shirts with corny slogans like “We the Norm,” “Too Lit to Politic,” “I’m Moving to Canada,” and “Diet Starts Monday”—all of which he models on his website with the same deer-in-the-headlights stare he has worn since July 2015. Clickbait sites collected their “Top 15 Tweets from Toronto Councillor Norm Kelly,” and American media even took notice, with a rapturous profiles from BuzzFeed, The Guardian, and the podcast Reply All that made virtually no acknowledgement of Kelly’s actual politics. But it was all built on a poisoned foundation, and soon people started wondering if viral-ready anti-Trump tweets carried much weight coming from a climate-change skeptic who voted against making Toronto a sanctuary city. 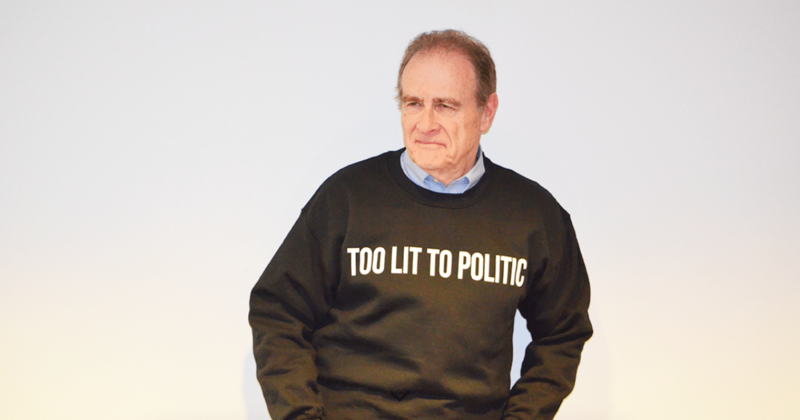 Groups like Black Lives Matter demand more than @norm’s rappin’-grampa shtick (summed up by a recent Vice article, “Norm Kelly is Taking a Lot from Black Culture—and Giving Very Little Back”). @norm’s decline has been hastened by the rise of Justin Trudeau, a politician who more fluently speaks the language of clickbait, and who does it without seeming like he’s being held at gunpoint. Perhaps another factor has been the unsuccessful presidential campaign of Hillary Clinton, a hawkish neoliberal whose superficially #woke campaign (“7 Things Hillary Clinton Has in Common With Your Abuela”) raised consciousness about the gulf between optics and substance. @norm was never, ever good, but 2017 is the year in which he finally, undeniably died. It’s difficult to pinpoint the exact moment. Was it the February Vice profile, when Kelly grunted about “social justice warrior types” and struggled to name five Toronto rappers? (He came up with four, one of whom was Drake). Was it in March, when the man who is “Too Lit to Politic” voted against funding homeless shelters? Was it April, in the days after Councillor Ron Moeser’s death, when (as tallied by journalist Jonathan Goldsbie) @norm tweeted 17 times about sports, five about the #6DAD clothing line, three about food, and zero about his deceased colleague? But why do you have a 12 car garage, @21savage?